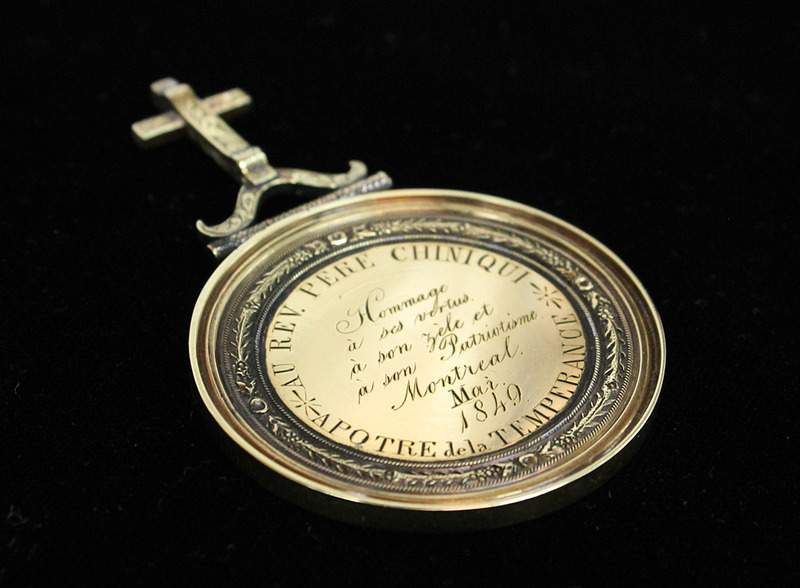 A selection of 19th-century artifacts recently acquired by the Canadian Museum of History recall the melodramatic story of Charles Chiniquy, a charismatic Catholic priest and Quebec temperance crusader with some prominent character flaws and a genius for personal reinvention. Charles Chiniquy’s fall from grace was as spectacular as that of any contemporary televangelist or moralizing politician with a dark secret. He was a Catholic priest propelled to the heights of popularity in mid-19th century Quebec by a fervent preaching style that made temperance a cause célèbre and was said to have inspired 200,000 conversions within an 18-month period. But his charismatic, theatrical streak also worked against the celebrity priest. In 1847, 14 years after being ordained, it caused him to be turned away from the Missionary Oblates of Mary Immaculate. Dogged by allegations of serial sexual impropriety, he was relocated to Illinois in 1851. Soon after, an ongoing clash with his Bishop — whose authority Chiniquy refused to submit to — led to Chiniquy’s excommunication. Chiniquy knew what to do for an encore. Converting to Presbyterianism, he became zealously anti-Catholic, captivating a new audience with an insider’s tales of the “evils” of the Roman Catholic Church. His denunciations fed into an influential movement within the English-speaking world that demonized Catholicism. Artifacts and documents acquired by the Canadian Museum of History speak of Chiniquy’s turbulent journey. First printings of his temperance manuals recall his initial popularity in Quebec, where the temperance movement called not for prohibition of alcohol but for personal restraint. His bestselling books Fifty Years in the Church of Rome and Forty Years in the Church of Christ represent Chiniquy’s life after Quebec and Catholicism. One object, his temperance medallion, reveals something consistent across the two eras. 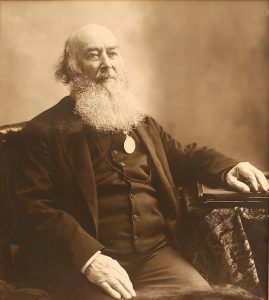 Charles Chiniquy wore his temperance medal he received from the Bishop of Montréal all his life. The article praises the work of Charles Chiniquy within the Roman-Catholic church but denigrates his work as a Catholic-Christian and Protestant by characterizing it as misguided and unstable, which is an unfair depiction of a man who is appreciated by many today as a respected reformer. The article is too heavily focused on the propagandist perspective put forth by Marcel Trudel and should include other perspectives, such as Serge Thériault’s Msgr. Rene Vilatte: Community Organizer of Religion 1854–1929 (Berkeley, Apocryphile Press, 2012, 305 pages), and Richard Lougheed’s The Controversial Conversion of Charles Chiniquy (Toronto, Clements Academic, 2015, 430 pages). Many Franco-Protestants celebrate the achievements of Charles Chiniquy, a man who was not perfect but who nevertheless had an impact on his time. The Museum prides itself on its commitment to the presentation of Canada’s history through multiple perspectives, and appreciates the interest and thoughtful feedback that this article has generated.